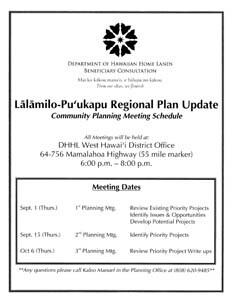 The Department of Hawaiian Home Lands Planning Office is holding a series of community planning meetings beginning September 1, 2011, to review and update the 2008 Lālāmilo-Pu‘ukapu Regional Plan. The first meeting in the update of the Lālāmilo-Pu‘ukapu Regional Plan is Thursday, September 1, in Waimea on Hawai ‘i Island. The department looks forward to productive planning sessions and the community contributions to make these regions thriving Hawaiian communities.